This past weekend, I was able to stop by one of our local Big Lots stores and, as has been the case the last few years, there appears to be mostly standard to great items. They also appear to have some new, more Vintage-inspired pieces, such as the signs below. 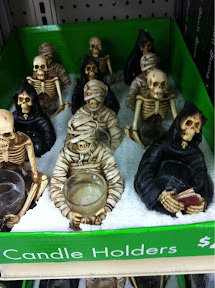 And I have a bit of a soft spot for these skeletal tea light holders? Although, at $4, the price is a bit much. I'll have to check out my local Big Lots! 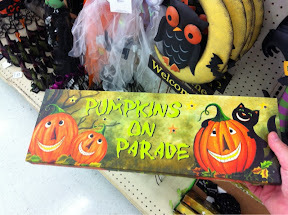 I haven't seen much Halloween stuff out yet around here, much to my dismay. 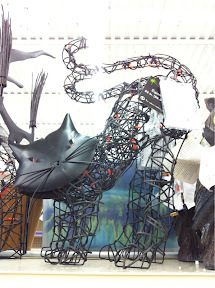 I've seen loads of stuff at AC Moore, Michaels, creeping into Christmas Tree Shop and at JoAnn's. Love this time of year. Mal: Absolutely! These photos were what was rolled out at the store by me over two weeks time. They also had two shelves still empty, across from this display, and I believe that will be filled with the seasonal household items (such as dish towels, door mats and the like.) So I'm sure there's more to come! Gail: I love all of those stores you mentioned. I haven't been able to make it over to Michael's yet, but I need to (as I need to stock up on their very affordable carve-able fake pumpkins!